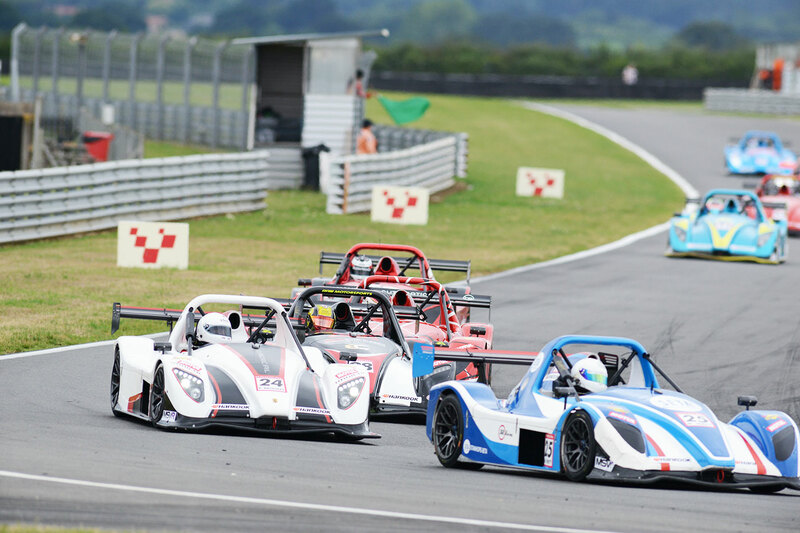 Both Mark Richards and Jerome De Sadeleer had the pace for podium finishers in the Radical Challenge at Snetterton, but good fortune didn’t match the pace and both completed the weekend, with more than their fair share of disappointment. De Sadeleer headed the 360 Racing quartet in qualifying and only just missed out on pole by 0.097 secs for the first race. “I knew I had the pace and felt like there was more to come, so very happy,” he said. Richards was fourth best, “I was losing time in the second sector, maybe 0.50 secs, but I have a strategy,” he reckoned. Although Martin Verity was 11th, he felt he could have been quicker. “I spun on my quickest lap at Murrays,” he explained. For Sam Moores it was his first time out for nine months, “made progress though,” he said after qualifying 18th. The safety car was out before the opening lap was completed in the first race, but De Sadeleer was settled in third, with Richards sixth Moores 14th and Verity 15th. From the green flag they all held station, but De Sadeleer was under pressure for third from Kristian Jeffrey. They shared a couple of exchanges before the pitstop window, but once the stops were completed it was Richards who had gained massively. “Kristian was only ahead for half a lap,” De Sadeleer confirmed. Only Championship leader Steve Burgess was ahead of Richards though and the gap to third placed Richard Baxter was comfortable. De Sadeleer had rejoined fourth, but was soon in trouble with gear selection problems and lost ground. “I couldn’t downshift,” he added. With only a lap to go Richards headed into the Wilson Hairpin for the penultimate time, “I just spun it and couldn’t restart,” he explained after he finally came home fifth, just ahead of the ailing De Sadeleer. Verity settled in 15th and Moores 16th. “After contact at the first corner I just couldn’t get into it,” said Verity. “I was pleased to just see the flag,” Moores added after a delicate seatbelt issue. The second race and the only sprint race of the weekend started well, with both Richards and De Sadeleer quick out of the blocks. “I was into third and heading for the Agostini Hairpin, when Brian Caudwell came across the grass and wiped my front out. Don’t know whether he had been pushed off or what,” said Richards. The safety car came out while the cars were recovered, with De Sadeleer in fourth and Verity and Moores 15th and 18th respectively. Gradually the quartet paired off, but on lap six De Sadeleer spun at Murrays. “As I turned in it felt like something broke on the rear corner,” he explained after later finding a broken upright. De Sadeleer tried to continue but was forced to retired after nine laps. Verity made it to the flag 13th and Moores 15th. “I got mobbed at the start and wasn’t taking any risks when it rained,” said Verity. “I had a few slides and was very wary when it rained too,” Moores added. Both De Sadeleer and Richards started from the back of the grid for the final race, after retiring in race two, but their progress was hampered again by an early safety car intervention. By lap six De Sadeleer was into 11th place, but just ahead was a six car train for fifth place, which included team mate Verity. With no success penalties at his stop, De Sadeleer was still optimistic of further progress, after pitting from 10th. When the green flag was waved he began to challenge John Macleod, who then locked up at the Wilson Hairpin, leaving De Sadeleer nowhere to go but into the back of him. 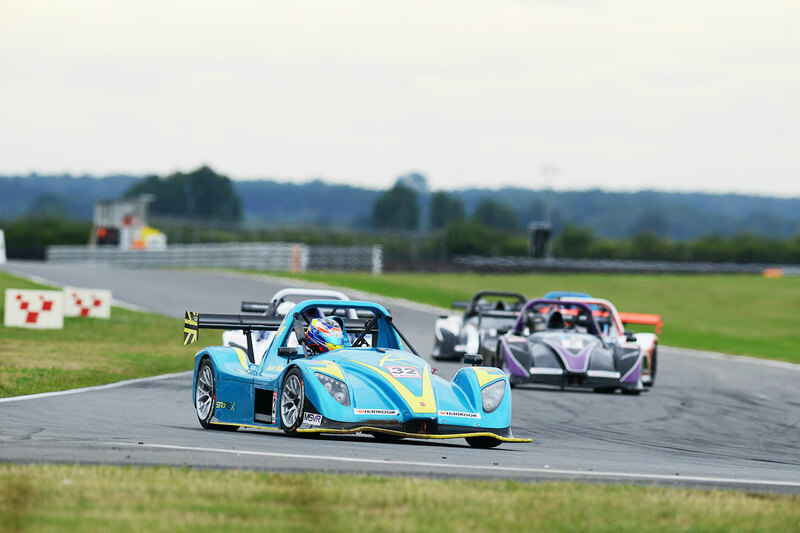 With De Sadeleer out, Verity went from strength to strength, and successfully held off challenges from Spencer Bourne and Brian Caudwell to finish a worthy seventh. “I just kept going but when I got close to Mark Crader I lost aero and had to back out again,” he explained. Moores led the race for one lap during the pitstop window and ran just outside the top 10. 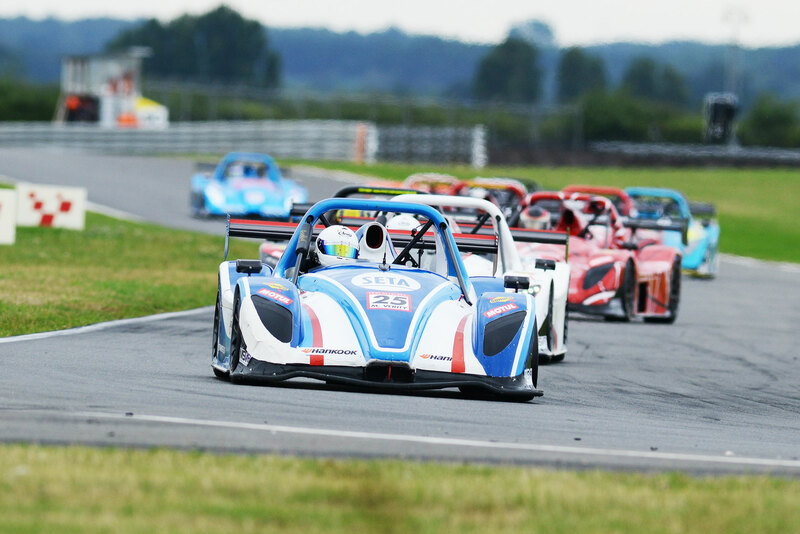 “The electrics began to cut out though and it died at the final corner,” he said. Richards did make it to the finish in a disappointing 12th. “It was understeering a lot and I couldn’t really do much, but got place through Riches on the last lap,” he concluded.